​Every few years it seems a Cinderella team takes March Madness by storm, exceeding all expectations in the NCAA Tournament with a stunning run deep into March. George Mason and VCU busted brackets in 2006 and 2011 respectively after making the Final Four as 11 seeds. Loyola-Chicago is different though. Unlike George Mason and VCU, they have consistent dominance. They have the longest active winning streak in the NCAA. ​They have Sister Jean. But most importantly, they have players who can both blow out opponents and come up clutch when needed. ​​Against Kansas State in the Elite Eight, ​Loyola-Chicago proved they have the ability to blowout teams. Sure, Kansas State may have been their lowest-ranked opponent in the tournament so far, but the score differential still speaks volumes. ​Donte Ingram made a buzzer beater in the first round to defeat the University of Miami. ​Clayton Custer made an incredible shot with 3.6 seconds left in the second round to defeat Tennessee 63-62. And who can forget this dagger by Marques Townes to secure their Sweet 16 victory against Nevada? How is Loyola-Chicago doing it? Why will they pull it off? Always aggressive defense, off-ball movement, incredible court vision, and almost near perfect shooting. Defensively, the Ramblers' scoring defense has been top-5 nationally for the second half of the season as the team has held opponents to less than 63 points a game. Additionally, guard play has been the team's biggest strength, as Missouri Valley Conference Player of the Year Clayton Custer has been dominant alongside teammates Donte Ingram and Marques Townes. All three players averaged over 11 points a game in the regular season, and fellow guard Ben Richardson has helped facilitate the offense. While Richardson is responsible for 18 assists in four tournament games, the team has had over 15 assists each game largely due to the four aforementioned guards. Additionally, Marques Townes can be the x-factor that wins the Ramblers the National Championship. After transferring from Farleigh Dickinson University, Townes is playing in his first season with Loyola after sitting out last year due to transfer rules. Not only has Townes proven how clutch and consistent he is, but he comes from a background of winning. Townes went to St. Joseph High School in Metuchen, New Jersey, playing alongside two-first round picks en route to a state championship and a victory in Jersey's Tournament of Champions. His teammates? Former 17th overall pick and current Trail Blazers G Wade Baldwin IV and also Karl Anthony-Towns, All-Star, Rookie of the Year, former number one overall pick, and one of the best young stars in the NBA. If Townes learned something from Towns and Baldwin at St. Joseph's, it was winning. 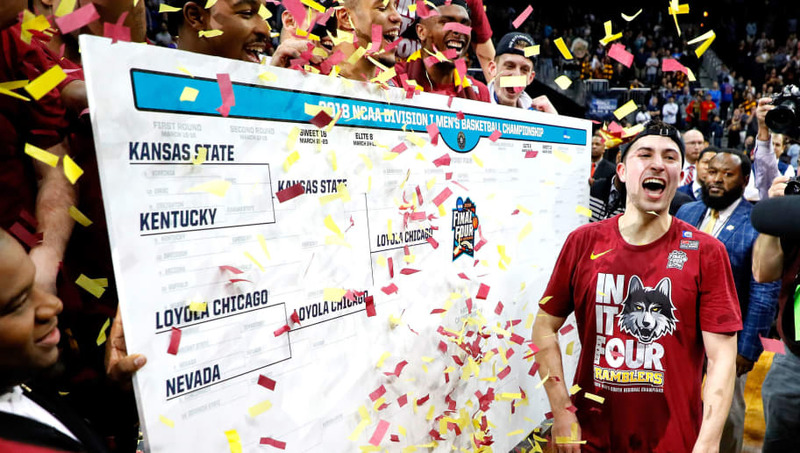 He has since brought that to Loyola-Chicago and will continue to bring it all the way to the National Championship.